In the past decades environmentalism has emerged as one of Western society's major ideologies. It groups previously existing and new environment-related concerns within a single area of interest. This has also led to the rapid development of the new academic field of environmental studies. The interaction and meeting points of Judaism and environmental issues are dispersed over a vast, largely uncharted area. One salient aspect of this is that there are tens of thousands of references in Tanakh, Mishna, Talmud, and Midrash literature to what we now call "environmental" motifs. 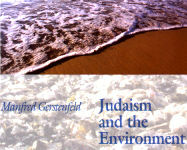 Jewish environmental studies could encompass disciplines such as Jewish environmental history, Jewish environmental law, the environment in the Hebrew Bible and later classical Jewish texts, Jewish environmental thought, Jewish environmental ethics, the sociology of Jewish environmental activism, the analysis of external perspectives, and several others. The development of the emerging discipline of Jewish environmental studies can contribute to much more than scientific progress alone: it can stimulate and enrich environmental activism and discourse in Israel and among world Jewry. It will also enable Judaism to participate as a more articulate partner in the developing inter-faith discussion.